2 What Is Automated Income Sites About? 3 How Does Automated Income Sites Work? 10 Is Automated Income Sites a Scam? I received an email promoting Automated Income Sites and I decided to take a closer look to it. When I first landed on their landing page, I saw some ridiculous income claims, which made me think that it was a scam. 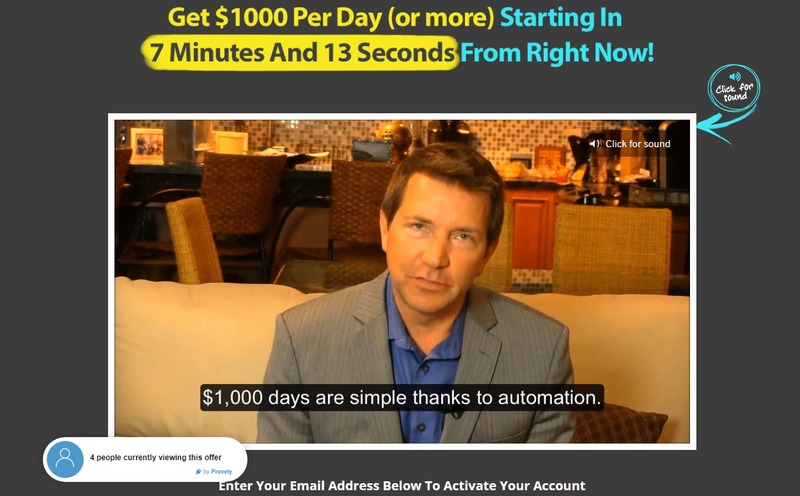 There is a claim that you can make $1,000 a day starting from 7 minutes from now. This only detail makes me think that it is a scam because the income claims seem totally unrealistic. Unfortunately, some newbies believe these scams and that’s why they exist. How Does Automated Income Sites Work? First of all, I don’t think that this program is going to work. I say this because I make money online and I know the process how it works and I can tell you that it is absolutely ridiculous to believe in their income claims, you can’t make that kind of money instantly online. Building an online business takes time and effort. When you sign in to Automated Income Sites they give you a bunch of websites which are clones of existing websites and they claim that you can make money as they do. First of all, you can’t just clone websites to make money. Let’s say for example you can create a clone of one of the most popular websites like Facebook or Fiverr, there are scripts for every kind of website. But people are going to go to the original websites and not your clone. And this is not all. After you buy Automated Income Sites, there are a lot of upsells of cloned websites that you can buy. Don’t get me wrong upsells are not always bad, but when the original product doesn’t work, there’s no point of buying upsells. In fact, with Automated Income Sites, you’re not going to make a penny, with or without the upsells and no matter how many upsells you buy, you are not going to make a penny and let alone $1,000 a day immediately. Mack promises that you are going to get a personal coach to assist you, but in fact a batter name would be a salesperson because they only thing your “coach” does is trying to sell you. And yes, $97 is not all they want from you. They will try to convince you that you need what they are selling. And to make money with this system you will need to do the same thing that they are doing to you, just recruit new people to do the same. Mark recommends on his video his hosting company that he claims that he has been using for years. From some research that I did this hosting company is HostForFree. He claims that he has been sending business to this company for years but in fact this company is brand new, it was created in March 2018. They claim to have a limited number of available spots, but is this true? I don’t think so. Trust me, they would accept everyone who is willing to pay. No matter the system that you use, it is unrealistic to make $1,000 a day starting 7 minutes from now. 1. It is possible to get a refund. 1. Unrealistic income claims. I have reviewed a lot make money online programs over the years and I know that those which present unrealistic income claims are scams. I totally believe it is a scam. I have seen so many of those and all have the same characteristics. There are a lot of scams online and when such a program starts not getting anymore sales, the owner re-brands it and promotes it as a new program. People start buying it again thinking that maybe the new product may work. Scams have a short lifecycle, a year, or at the maximum 2, because negative reviews about them start appearing on the internet. In the sales video they also include fake video testimonials. If you think about it, everyone can prepare a video testimonial of something and this doesn’t mean that they bought the program. Obviously, for the reasons stated above, I am not recommending this system. I don’t believe that you are going to make a penny from this system, let alone $1,000 a day. So, stop wasting time on scams like this one and check my #1 recommendation for making money online, the one from which I have learned everything I know about internet marketing and the one which I rank as #1 from all the systems that I’ve reviewed. The best thing is that the platform that I am recommending you is free to join, so you can chack it for yourself and be sure about it before you spend a dime on it. Previous Previous post: What Is Digital Payday About? Make $5,000 in a Day?? ?